Landscapes, portraits, abstracts... oils on canvas, watercolor, prints... all of them turn the sidewalks and stairways of Rovinj's high street into an open-air gallery. 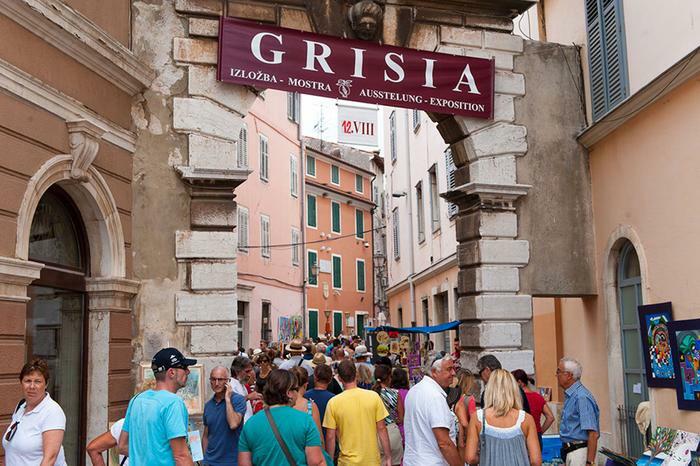 Grisia - the name of both street and exhibition - is Rovinj's landmark event. From the lively central square of Rovinj, filled with cafés and restaurants, Grisia street winds its way up a hillside. Its name has found fame as the largest open-air art exhibit in Croatia. Every August, there comes a Sunday when dawn finds Grisia covered with art. Croatian and international artists present their finest works leaning against the walls of stone houses, in windowsills and on the sidewalk. Professionals and amateurs, children even, turn all of Rovinj into an art gallery. From early morning to nightfall the wealth of colors and shapes delight the visitors, as do the prizes awardeded in the evenings. This massive street art event which Rovinj presents to its visitors each August is not to be missed. At the end of the colorful walk, at the hill's peak and the street's terminus, an additional prize awaits - the Church of Saint Euphemia, a vantage point offering a stunning view of Rovinj and its docile surroundings.